Disabled ad blocker but still can't access site. The site independent.co.uk wants me to turn off ad blocking to use their site. I have disabled ad blocking for this site and it is listed in the exceptions but the sites irritating ad block message persists. I've even tried unticking trackers in the Privacy and security menu to no avail. Any ideas what I can do? Have you cleared the browser cache and any cookies for that particular site and then restarted the browser? Are you logging into the site? Are you using Private Browsing? I went to independent.co.uk and have uBlock origin and had no issues. Was never asked to turn off ad-blocking. 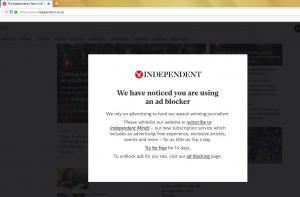 jedy wrote: The site independent.co.uk wants me to turn off ad blocking to use their site. Yeah? Didn't ask me to. I have already emptied cache and cookies. I'm not using provate browsing and cannot log in as I don't get that far. Something tells me it's recognising Firefox's in built tracker blocker. Simply disabling it for this particular site or trying to disable the tracker blocker completely doesn't help either. I have tested this site using Opera's browser, which has an in built ad blocker. I see this message with this browser too. Disabling the ad blocker for the Independent site works in this browser, just not in Firefox . Btw, I often see add blocker mesages on various other sites but usualy you can just close the message and carry on without disabling anything. jedy wrote: Thanks for the responses. I get the same behaviour as you in Opera and also in Safari on my iPad. I tried in Firefox just now and don't get the popup. It's something that's been added recently, though I don't understand how Firefox is immune (for me and the other posters). Kevin McFarlane wrote: I get the same behaviour as you in Opera and also in Safari on my iPad. I tried in Firefox just now and don't get the popup. Interesting. I don’t get any ad block pop up message at all when using Safari on my iPad and I do use a content blocker.